This new luxury beachfront resort is hidden in the mangroves of Guanacaste, a modern oasis with panoramic views, full-service spa, golf course, three restaurants and exciting nightclub. From a Living Room inspired by the local Guanacaste tree to the vibrant accommodations, natural elements complement a modern sensibility. 150 rooms and suites feature surf-cultured MIX Bars, locally influenced accents and glass-enclosed showers with incredible views. 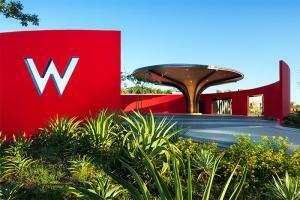 Lounge on the pool deck or at the W Beach Club before enjoying fresh seafood and local cuisine. The hotel is approximately 40 miles from Liberia Airport, and a short walk to Conchal Beach.